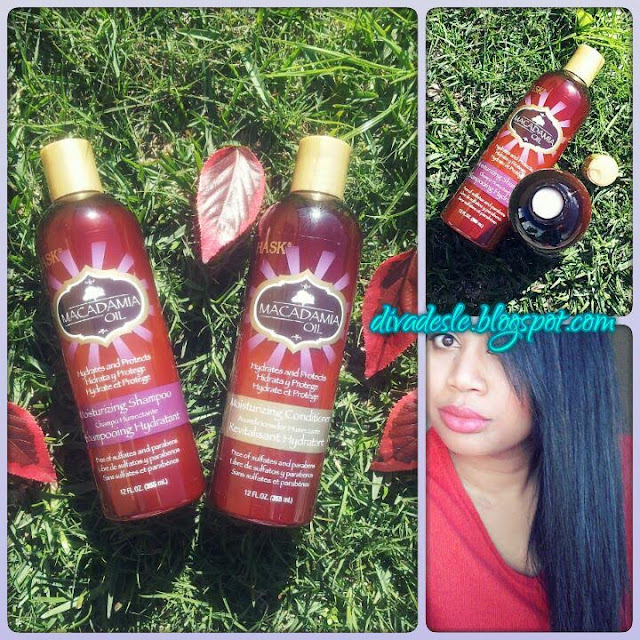 A few weeks ago I reviewed the Hask Argan Oil Shampoo and Conditioner on the blog. I also gave a short insight into the Hask brand which is relatively new to my side of the world. You can read the Argan Oil Post here. This week I will be reviewing my favourite from the Hask line which is the Macadamia Oil shampoo and conditioner. Macadamia Oil is another miracle product for your hair. The oil is obtained from Macadamia plant seeds and it is rich in Vitamin E, Vitamin B Complex, Calcium and Iron. These super nutrients coat the hair and protect it from further damage such as breakage and dryness. The oil is light weight and absorbs easily into your hair, making your hair silky smooth and frizz free. The oil is also known to protect your hair from sun damage and leave your hair with a healthy shine. On the Hask bottle the products are described as a hydrating and moisturising shampoo and conditioner. It promises to quench your hair's thirst by adding extra hydration and moisture and eliminate dry damaged hair. These products are Paraben, sulfate and alcohol free as well as cruelty free too. The products come in a generous 355 ml bottle which I love. The more product quantity the better for me, because you get your money's worth. The shampoo has a thick pearl white consistency and smells divine. It has a sweet vanilla scent which I adore. I love anything vanilla. The rich creamy shampoo lathers well throughout my hair. It cleanses my scalp thoroughly without leaving it feeling dry or itchy. The shampoo is very moisturising and softens my hair whilst cleansing it. It is really easy to work through my hair and a little product goes a long way. The conditioner has a light white creamy texture, but don't let that fool you. This conditioner is packed with moisture. I love to coat my hair in as much conditioner as possible and leave it on my hair for about 15 minutes. I swear this conditioner is amazing. It feels so light weight on my head but it deep conditions my hair making it tangle free and super soft. When I rinsed the conditioner out of my hair I couldn't believe how soft and tangle free it was. As I have mentioned in a previous post I have long and thick hair. This conditioner made my hair so silky smooth, it was such a breeze to blow dry my hair and style it. As you can see in the photo above, my hair is smooth, straight and shiny. The shampoo and conditioner definitely does what it says. It moisturises the hair leaving it soft and smooth. These products I feel are much heavier in consistency than the Argan Oil range. It made my hair really smooth and my hair had less volume. If you are someone with thin hair and you are looking for an extra bounce and body, then the Macadamia range might be a little too heavy for you. I do have to mention that there are surprisingly completely mixed reviews about the Hask hair product range. Some bloggers love it while others hate it. My blogger friend Kim from Averysweetblog, did not have a good experience with these products. It made her hair brittle and dry. You can read her review here. I guess you won't know if these products will work for you unless you give them a try and read reviews before hand. I've never considered macadamia oil looks good! I'm so glad these worked for you Desle. Your hair really looks great! So happy for you! Thank you for including my experience. It really damaged my hair, so I'm working on repairing it. It's good that others now can be informed. Check out the newest What Would Lizzy Vlog! The vlog, not her regular channel. She was talking and said she had to stop using HASK because it was drying out her hair. I was like OMG'D! These sound good! Too bad we don't have it here! Love oils at the moment!